The church of St James’s on Garlick Hill in the City of London has a little secret that’s not put on display anymore. It’s a mummified body that used to be a key attraction. 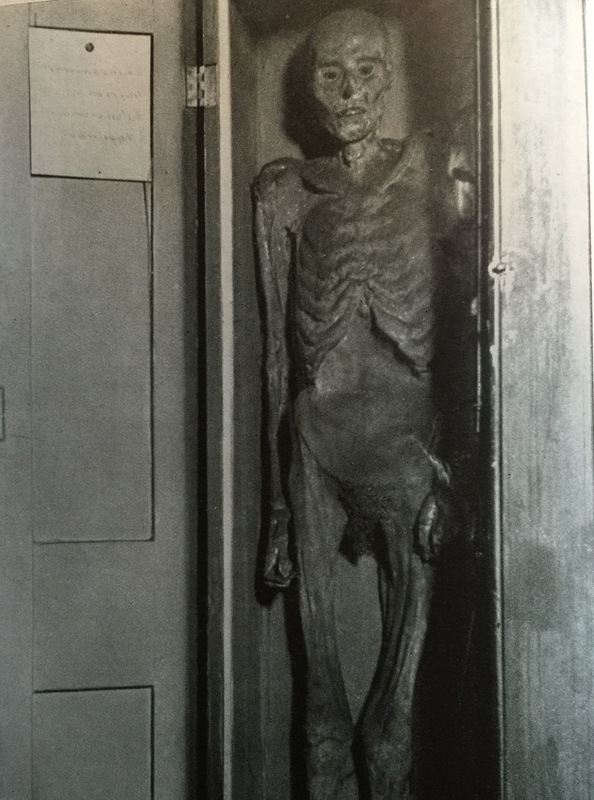 In a 1937 guide to London, there’s a photo of what’s claimed to be a medieval body. It was discovered in 1839 when the vaults were finally being closed up. The dead man was in almost perfect preservation but had lost all of his hair. A choir boy in the 1880s claimed that the other boys would take it for a run round the church before putting it back in its case! More recent research suggests that the body was not medieval but dated from between the seventeenth and early nineteenth century. The church website doesn’t mention the mummy and it’s no longer put on view. However, it’s still there – somewhere. So if you’re passing by this church – you might want to pop in and ask if you can see Mummy! ..Love your postings Tony..!! It’s my fondest dream to visit London, & all the more after reading your blog.., Keep up your excellent work..!! !